It actually has a different name, some cockamamie name like Giorgio Baldi. There’s a story behind that, I just don’t know what it is. There’s probably a LOT of stories behind this restaurant. 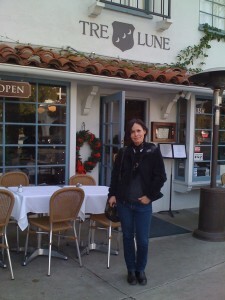 And some rumors like that this restaurant first started right here in Pacific Palisades. It didn’t quite “make it” here and moved to it’s permanent and quite successful location in Santa Monica canyon. Which of course, proves my conspiracy theory about the Palisades (refer to earlier piece called conspiracy theories). Tonight I really amused my bouche. And, I hope I amused my husbands and even Domy’s bouche. And yes I do love that it all sounds very naughty. I’m glad to say it’s really G-rated, is French and literally means it entertains the mouth. It is a small appetizer served at some great restaurants. When I am served an Amuse Bouche in a restaurant, I often get very greedy and ask for more. Maybe it’s greedy AND rude, I’m never sure. And yet, I still do it. Just did it the other night at Fraiche in Santa Monica when they gave me one small bite of the best caesar salad I’ve ever had. Ten of those amuse bouches could have made a nice little meal for me. 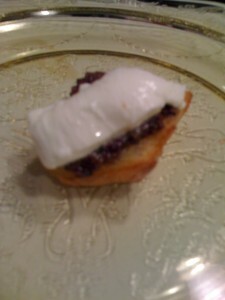 The appetizer I made for tonight was crostini served with an olive tapenade and burrata cheese. How simple it is to make and how impressive it is to serve. I totally copied from one of these restaurants, both served a version of this dish. It was either Delfina Restaurant on 18’th street in the Mission district of San Francisco or Rustic Canyon Restaurant on Wilshire in Santa Monica, California. Tags: amuse bouche, burrata cheese, delfina restaurant, fraiche restaurant, fredde duke, rustic canyon restaurant, s.f. 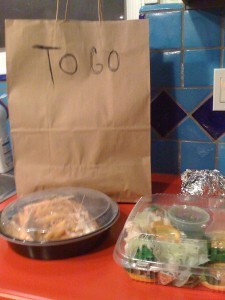 You are currently browsing the Channeling The Food Critic in Me blog archives for January, 2010.